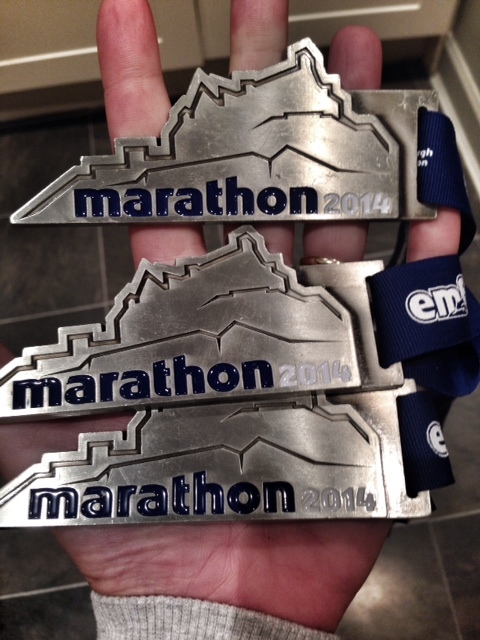 You’ve got to do your local marathon, and with the start line literally outside my door, there was no excuse really. I’d signed up late last year not really sure of what my plan would be, and with my first 100 mile race planned only 4 weeks after this, it had to be a training run rather than a race for me this year. 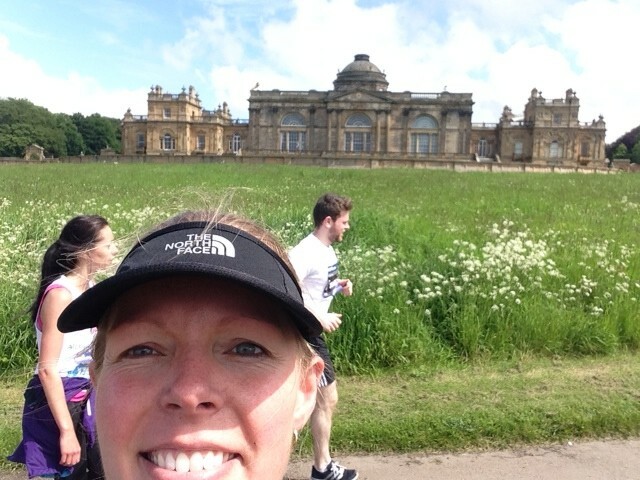 To stop myself racing I offered to pace my friend who was running this as her 2nd marathon to completion (having pulled out of her last one with injury) and with her wanting a sub 4 hour finish. 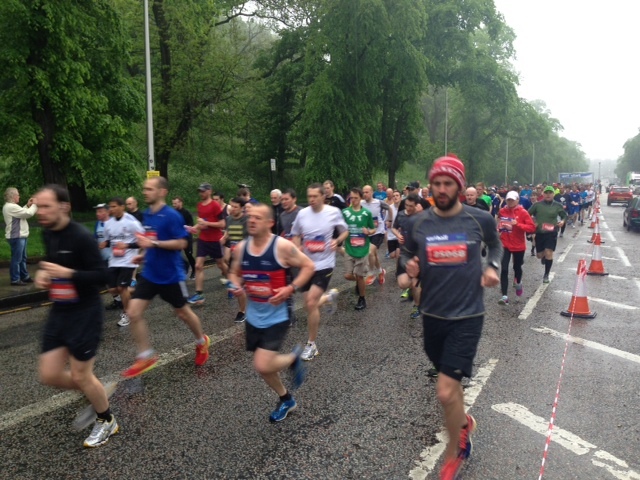 The Edinburgh Marathon Festival wasn’t just about the marathon but a whole load of different races. On the Saturday there is the 5km & 10km run for the adults and a series of races for the kids, with a 1.5km & 3km to be run. The atmosphere was fantastic and really gets you in the mood. Not having kids myself I never would have gone along to watch the kids races but with a friend’s daughter running the 1.5km we went down to watch, and I was so inspired! Amazing to watch the little ones sprinting their little hearts out and what a fantastic way to showcase the city as well. I had a load of fitness pals up for the various races over the weekend from Bioticfit in Manchester, so had arranged a pre race “Pasta Party” at Crowne Plaza Edinburgh – Royal Terrace, along with a bit of a #tweetmeet with a few other runners I had never met in person but had been tweeting within the lead up to the race. It was great to catch up with everyone over some tasty food. Sunday – Race day! We awake to torrential rain, not exactly the perfect running weather. Thankfully the marathon didn’t start until 10am so we had plenty of time to get sorted, especially as it was a 2 minute walk to the start line for us. My friend and I ventured out and saw the half marathon start in the torrential rain before breakfast. Due to the poor weather and because I knew I wasn’t going to be running at speed I opted for some comfort food and ditched the porridge idea and munched on a Bacon & Egg ciabatta instead, delicious! Of course I made sure my friend had the porridge though to fuel up for the big event. I’ve run many a long run on bacon & eggs with no adverse affects and I think the experience of ultra running and multi stage events has made me realise that all the talk of overloading on carbs is a bit of a myth. The body can only store a limited amount of carbs in any case and I certainly don’t get the chance on multi day events such as Marathon Des Sables to over carb load, and manage to run in extreme conditions and extreme distances without what most would consider enough calories. 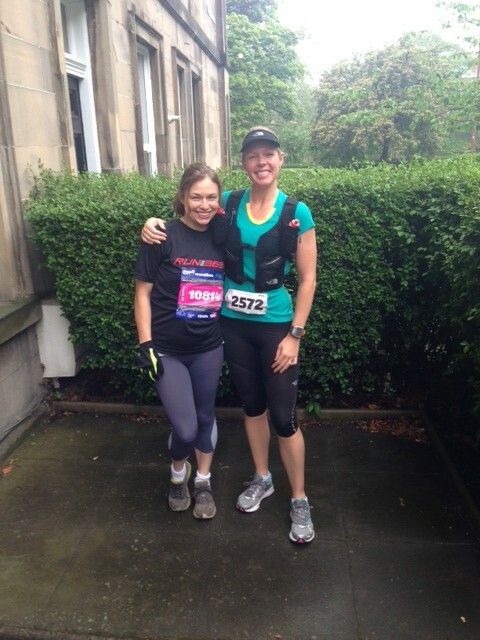 Gillian and I before the start. At 9:30 the weather finally clears up and fair weather runner hubby decides very last minute that he might as well run it too. It is a great atmosphere on the streets and with 8,624 marathon runners there are 2 starting areas on London and Regent Roads. We are on the Regent Road start, with a nice downhill to get us started. My friend wants to start at roughly 9min/mile pace and carry this through. Secretly I am concerned as I am used to starting off quick and then slowing down, so a bit worried about maintaining that pace for 26.2 miles. We start off well and manage to maintain at about 8:40m/m for the first couple of miles in the excitement of it all, as we go past Arthur’s Seat and around Meadowbank Stadium we slow it down to just under 9m/m. By mile 5 my friends pace is slowing to about 9:20m/m and I gently tell her we need to pick it up a bit, already concerned about the sub 4 goal so early on. I can tell she is struggling to get to the 9m/m pace we had agreed and by mile 10 I tell her that unless she has some secret speed energy stashed away, the sub 4 is out the window. She tells me she doesn’t mind, that she just wants to finish so I resort to just getting her to the finish. The weather is holding out nicely and the sun even makes an appearance. I am running in my North Face kit that I received just a few days prior, breaking all the marathon rules of not trying anything new on race day, wearing a new shirt, new bra, new ¾ tights and wearing a bag that I had never run in before as well as trying out gels that I have never tried out before either! I take my first gel at the 30 minute mark, a delicious Torq Raspberry gel. It tastes as good as a gel can, and I take the next 30 minutes later, followed by a Torq bar another 30 minutes later. This is the first time I have been so consistent with energy and I can feel the difference. I am absolutely buzzing! I think the energy mixed with the slower speed and I feel invincible like I can run forever. My friend on the other hand is relying on Rowntree’s fruit pastilles, and is seriously struggling. I can see it in her face, in her body language and hear it in her breathing. She is feeling too warm and at the next water station I get her to tip some water on the back of her neck which helps cool her down a bit. I had asked her about energy before race day, but this is what she had trained with, she wasn’t keen to try gels on a race, but had said she will try this moving forward. Just after mile 16 there is the first ‘energy station’ stocked with High 5 gels, I encourage her to try one to see how it goes as she needs something. I take as many gels as I can to stock up and try my first High 5, pleasantly surprised, it tastes pretty good too. 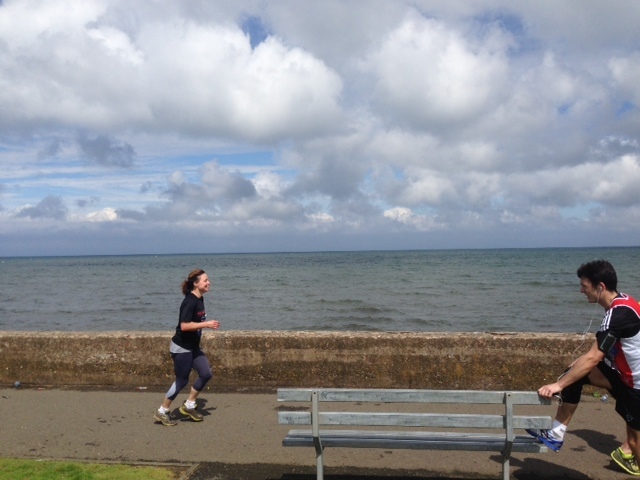 My friend ‘enjoys’ hers as well and you can visibly see it has lifted her somewhat, not enough to crack on at any more pace, but she keeps going which is the main thing. I make sure that she takes a few more along the way and restocks at the next energy station at mile 22 & 24. I don’t understand why in races, the organisers don’t have the gels available from the start as you need to be taking them from the very beginning, by mile 16 it is too late! At various points on the race you see the faster runners having reached the turnaround point coming back past you, and at about mile 16 I manage to catch hubby running past at what must be between 19 & 20 miles on the other side. I cheer wildly and get his attention, just! I work it out in my head that he is on for a quick time which is fantastic! 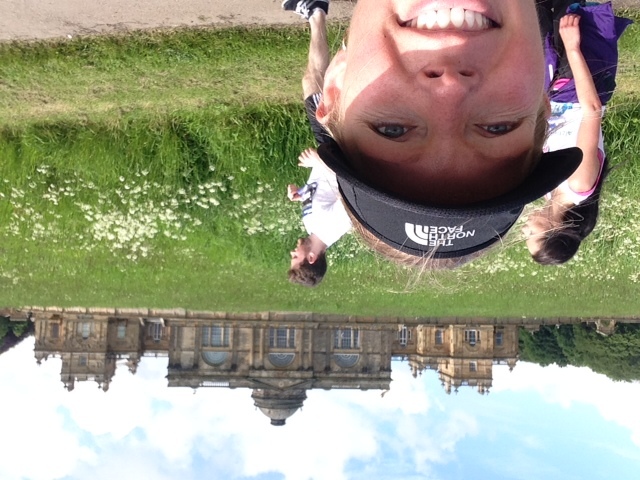 Me at mile 18 in the sun! The crowds are amazing along the way, particularly the MacMillan supporters who are everywhere cheering loudly. Loads of locals are out in their front gardens cheering all the runners on, handing out sweets, setting up their own water stations with plastic cups. It really is great to see and I participate fully high fiving along the way and dancing with the cheerleaders and the Brazilian dancers en route. I am far too cheerful and excited to be in this time bracket for a marathon so I hope I didn’t annoy anyone too much with my exuberance! As we come into Musselburgh for the finish the crowds get thicker and towards the finish line it is like something out of Tour de France with the crowds closing in to almost a single track finish. We finish! 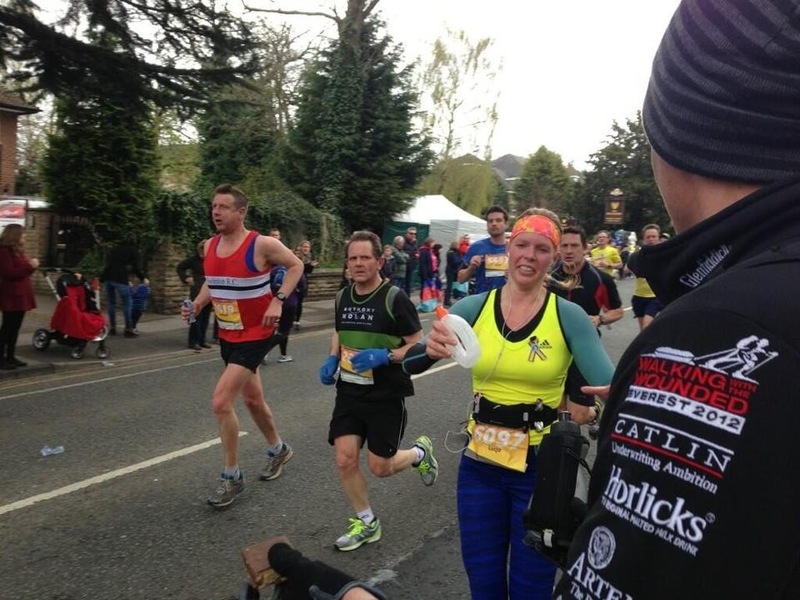 It’s been a hard slog for my friend, but I made sure she didn’t walk at all, so she ran a whole marathon, well done! I feel great, and feel I could run another one (sorry but it’s true, and I feel so proud to say it too) but she is struggling now to walk anywhere very quickly. I have no idea where hubby could be so we head over to the VIP tent which is the only area we had mentioned about meeting. No sign of him in the tent, but we do find a couple of our other pals who we manage to get into the VIP tent with us, and we get my friend in to sit down and quickly get her some water and make up a For Goodness Shakes recovery shake, she is looking white with blue lips. We get her some food quick smart as well, and slowly but surely the colour starts to come back. I get hold of Dion and hear that he smashed it with a 3:10 finish! How awesome! He had waited for us but got too cold so he ran the 5 miles home, yes ran! The beauty of being an ultra runner. Our medal haul, Gillian, Dion & I! 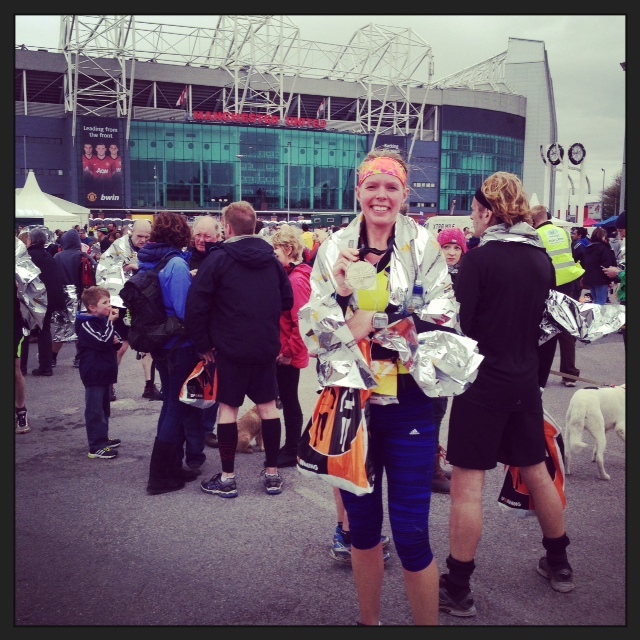 I really enjoyed my day, it was great to run a marathon without racing it and I had loads of fun. It has filled me with confidence for the upcoming 100 miles as I can clearly see that if I just keep my pace right and my fuelling right it should all be just fine. 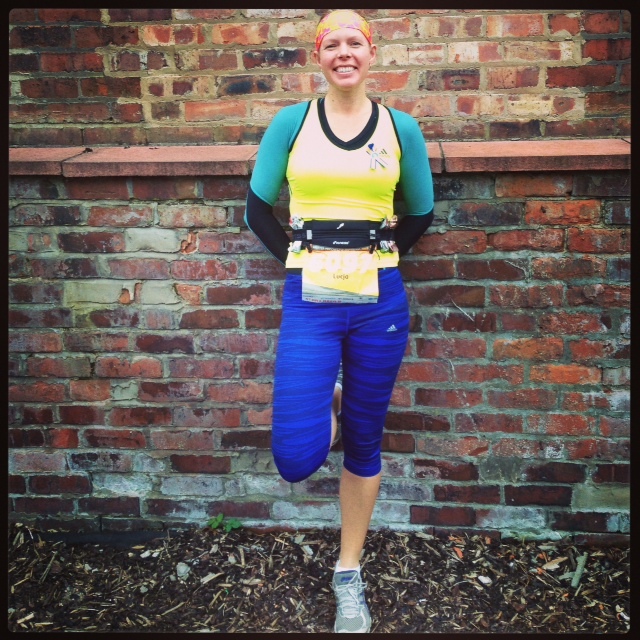 My friend on the other hand has a marathon finish which is great, but really needs to go back and look at how she is training and how she is fuelling her body. As she explained to me, she ran to lose weight so the thought of eating and taking on so much during a race is foreign and almost wrong. 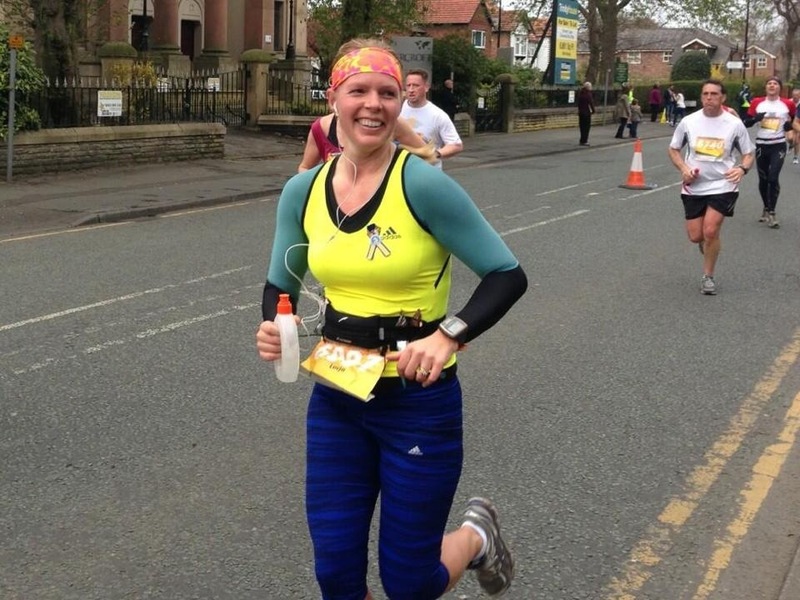 But as I explained to her as I have done the same thing and it is really hard to change your mindset, you are no longer running to lose weight as you’ve lost it you are now running to get fitter and stronger so your body is a machine and needs to be fuelled as such. I normally like to go for a recovery run/jog the next day but unfortunately miss this due to timing, however we do get out and walk for about 4 miles over the morning which is a good flush out as well. I follow this up with a 7 mile run on the Tuesday morning at a gentle 9m/m pace on fairly flat ground followed up by a great sports massage by Nicola at Fasic in Edinburgh. It does the trick and by Wednesday I am back to normal. So now 3 weeks to be ready for the Mohican 100 mile race over in Ohio on June 21st & 22nd. Wish me luck! Still having some energy to burn this morning, I started the day with a free weights session at home. Half hours worth on the upper body and 15 mins of lower body followed by some planking and 3 sets of 10 push ups. This afternoon headed out at 3pm with the hubster to knock out some miles. We headed out through Didsbury (had to drop the weekends lovefilm at the post office 😉), through Didsbury park and down along the River Mersey, back through Chorlton. It certainly was varied, running on pavement, then trail, mud, sand & snow. Hubby threw in a few hills as well, so it was a tough 13.1 miles, could feel the bum cheeks getting a bloody good workout! A nice hot shower followed by a hot cup of tea and a foam roller session, now what’s for a woman’s dinner? Woke up pretty tired so grabbed the bike to ride to work instead of a run, but made sure it was a run home, 7 miles each way. It’s days like these, the hard tired yards that count, pushing the body through tiredness, I just kept imagining Anglesey Ultra next weekend and how much more tired I will be! Had to stop on my way home…..to buy onions for dinner 😉Had a lovely chat to the shopkeeper who was in awe that I was running as a way of commuting, always nice to get some positive praise along the way.